CASE'd for the most part from our Stampin' Up! 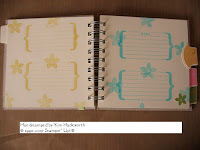 demonstrator newsletter, Stampin' Success. There's a lot of great ideas in there! Here are the pictures for the outside and inside. We are also making a maze book. I found this project at the Scrapbook Lounge. It is made out of one sheet of cardstock! The jumbo paperclip project was taken from splitcoaststampers but I can't remember who did it off the top of my head. 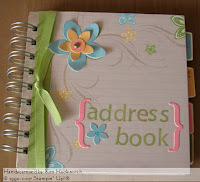 It makes a great scrapbook or card embellishment. 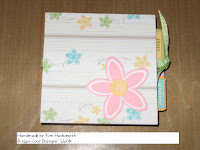 The papers used here on this sample are Provo Craft but we will be using our office papers from the Spring Mini Catalog. We may have a bonus project too if I can ever think to come up with one. Let me know if there is one that you would like to learn how to do and if I can figure it out or find the instructions, I'll try to add it. Guess I better stop playing now and go pick up my daughter from school!